Thankfully, with the publication of the Percy Jackson and the Olympians series, children are once again begging for any book about Greek gods and goddesses. My library's copy of D'Aulaires Book of Greek Myths is hardly ever on the shelf! Students also gobble up George O´Connor´s titles: Athena: Grey-Eyed Goddess and Zeus: King of the Gods. Once children are introduced to the adventures of these oft-times bothersome deities, I then steer them to books about the Trojan War. I hand them Rosemary Suttcliff´s Black Ships Before Troy: the story of the Iliad, The Wanderings of Odysseus: the story of the Odyssey or Gareth Hinds graphic novel about The Odyssey. Both excellent introductions to the Homeric epic. There have been people throughout history. regular folk and historians alike, who have wondered if the Greek gods and the Trojan War really existed. 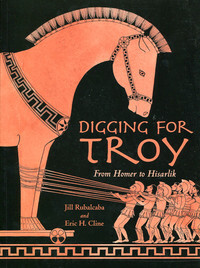 Digging for Troy (a CYBILS nominee) written by author Jill Rubalcaba and Eric H. Cline, PhD. who holds degrees in Classical Archaeology, Near Eastern Archaeology, and Ancient History, have written a readable introduction that offers mythology fans a brief overview about the Trojan War and the people who made it their life´s work to find it. Digging began in 1893 with the egotistical Heinrich Schliemann, whose obsession with finding the "real Troy" lead him to destroy many important artifacts. The ones who came after were meticulous with their digging. German archaeologist Manfred Korfmann is responsible for establishing Hisarlik, the area in Turkey where the digging has taken place, into a national park. Did he find Troy? You’ll have to read this book to find out. The book, packed with lots of information, is filled with illustrations and photos. This book has a timeline of Troy(I love it! ), a bibliography, web sites, source notes, illustration and photo credits, and an index. Children who wonder if the Greek gods were real, and whether the Trojan war really happened, will be able to make their own decision. The book is a perfect companion for any display or book talk related to the Greek myths.